The "Badischer Verlag" and "Welt am Sonnabend" are the oldest book publisher of Prinz Eisenherz in the German Language (before this our Prince was only printed in 1939 in the Magazine "Papagei", under the name of "Prinz Waldemar"). After this, first "Melzer", and later "Goldmann Taschenbuch" did all reprint the old work of Badischer Verlag and Welt am Sonnabend. 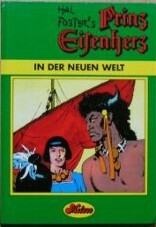 1st Serie: Reprints printed in 1975. Three books known this far. In color with the coloring of Buru Lan from Spain (see that chapter). Value; 20 Euro. 2nd	Serie: the different color volumes. Printed between 2003 and 2005. Value; 15 Euro. 3rd	Serie: the green books (between 1971-1980). Value; 15 Euro. This serie has different logo's on the cover and I am not sure if we're talking about different prints or simply other logo's in the same prints. The logo's are: "Melzer-Comic", "Comic-Companie" and "Comic"
There are several special editions in this serie: the first is "Abenteuer zweier Ritterknaben" (The Medieval Castle). 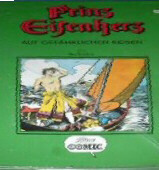 It's a smaller book, printed in 1976 in the Melzer serie "Comic Archiv". 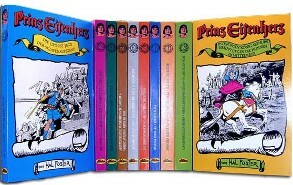 Besides this there were two special volume printed in the second serie; book 1&2 and book 3&4 in one volume (1974 & 1975). 256 pages black&white. These are the Max Trell books (also re-printed in serie 6 and 7. 4th Serie: the green books with yellow title strip. This is the second print of serie 3. Printed from 1981-1983. Value; 10 Euro. Abenteuer zweier Ritterknaben (The Medieval Castle) is included in one of the books..
5th Serie: the green books with "Brumm Classix" or "Brumm Comic" as trademark. Value; 20 Euro. In this series they did publish three albums. Printed in 1974 for a book-club. 2: Kämpft gegen die Hunnen. I never did see volume 3 or any other part. This was only announced, perhaps never really published. However, some say that the same amount of titles as serie 4 are published. 6th Serie: The Max Trell stories in small format books. Value; 15 Euro. In this series they did publish at least two albums. Printed in 1973. 7th Serie: It seems that Melzer bought the printing rights from Gondrom Verlag. They are now (2005) printing the Gondrom books (Edetion Actuell) in very small format, 12*19 cm. On the Melzer website you can buy the whole mini serie at once. See the pictures with the Gondrom paragraph. I am not completly sure about the numbers and titles of volumes per serie for serie 2,3, and 4, but I think it will be only 14 or 15 volumes for each serie, with the titles below. 1: In den Tagen König Arthurs. 6: In der neuen Welt. 7: Zwischen Leben und Tod. 11: Abenteuer zweier Ritterknaben (The Medieval Castle). 12: In Auftrag des Königs. 13: Im kampf gegen Dänen und Sachsen. 14: Die Reise in den Orient. Serie 2; Different color range. Serie 4; Green book with yellow stripe. Serie 6; Small Max Trell books. Serie 7; Mini reprints from Gondrom Verlag.